Bouvier des Flandres Dogs - The Bouvier des Flandres is a large breed of dog originating in Flanders and a member of the herding / working dog class. They are used for general farm work including cattle droving, sheep herding, cart pulling, and as guard dogs, police dogs, and security dogs, as well as being kept as pets. The Bouvier is a powerfully built compact rough coated dog of rugged appearance. He gives the impression of size and strength without clumsiness or heaviness. Perhaps his most notable feature is his impressive head which is accentuated by a heavy beard and mustache. 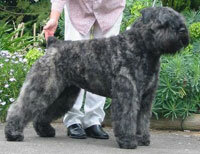 The ears and tail of the Bouvier are sometimes cropped, though several countries have outlawed such practices. This information is licensed under the GNU Free Documentation License. It uses material from the Bouvier des Flanders article on Wikipedia.org. Bouvier des Flanders Breeders - Advertise your kennel puppies and dogs here.